While driving in the car. I listen to songs that I would be too embarrassed to tell anyone that I still listen to. The world is my oyster in my car and no song or idea is too outlandish. It’s great because I have no one there telling me what I should be doing, no kids telling me what I need to do… just me and my thoughts. Boy do the ideas flow. I can’t tell you how many work ideas or blog posts I’ve come up with there. I even took my accident from a month ago and turned it into a positive. Well – a positive for you I hope. That car is still totaled. Fellas you know what I’m talking about. Mother nature starts knocking and the first thing I’m reaching for is something to read. Just like with driving the car, this is my time. The kids might be burning the house down and my wife chasing after the dog with a broom but I’m settled in and creating creative things. Hey did you know that there really was someone named Thomas Crapper who increased the popularity of the toilet? He even invented the ballcock. Crapper with the ballcock? Oh good grief nevermind. Stressful day get you down? Concerned over that big project that’s due tomorrow? There’s no better way to get more sleep than by tossing it around and around in your head while LAYING IN BED! Whoo hoo. 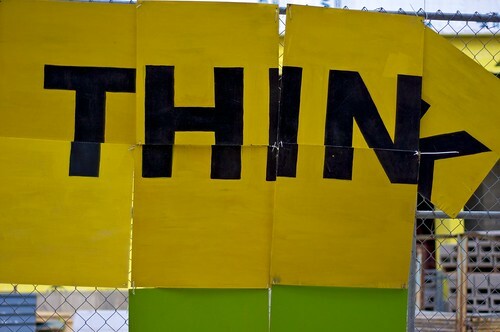 Sometimes when it isn’t keeping you awake and making you worry, you’re also perfectly capable of thinking big things. I thought of this very blog post just before bed one night. Not impressed? Neither am I really… I don’t sleep much. While working out at the gym. There are two things I really love about the gym, besides the bench pressing and steroid use, and that is the people watching and thinking big thoughts. The gym has always been one big hilarious social experiment for me. It’s filled with people who have just rolled out of bed, 80’s stretch exercise shorts on men (Thanks but I don’t want peanuts), wife beaters, mismatched clothes and smelly dudes. The mens locker room smells like a dirty rubber sock mixed with bad BO and sweat. Under no circumstances is it a good smell and quite frankly, after every visit there, I wonder how in the hell you ladies find us even remotely attractive. Looking at myself naked is gross enough but … my God. Despite the smells, ambiance, and girls, it’s where big ideas can be had. Most times it’s just me, the equipment and my thoughts, in between sets or while running nowhere on the elliptical. Boring! You wants to actually do yard work? I’d rather just hire someone. But seriously everyone, this is a little used excuse to spend 3-4 hours outside with no kids and no wife. I love both of them (my wives … err.. I mean my kids and my wife… oh nevermind) but it can be nice to get away without actually getting away. Need to rake leaves? 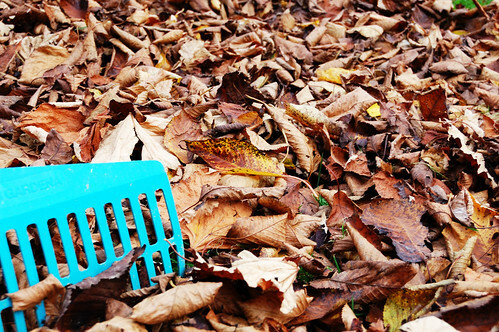 Get out there and do it – bring plenty of trash bags, a really small rake and a notepad. Because while you’re huffing and puffing, you’ll want to stop to write stuff down. Believe me – the ideas will come. So what did I miss? What golden places do you use to not only get away but where you do some serious thinking? The comments below are all yours. When your wife/husband is talking to you. Thanks for Jon Skilling and r0kk @ Flickr for the great pictures! And to my dear and darling wife… I love you. Open Letter to Twitter: Here’s why we use 3rd party apps.